Amazake (甘酒, [amazake]) is a traditional sweet, low-alcohol Japanese drink made from fermented rice. Amazake dates from the Kofun period, and it is mentioned in the Nihon Shoki. It is part of the family of traditional Japanese foods, made using the koji mold Aspergillus oryzae (麹, kōji), that includes miso, soy sauce, and sake. There are several recipes for amazake that have been used for hundreds of years. By a popular recipe, kōji is added to cooled whole grain rice causing enzymes to break down the carbohydrates into simpler unrefined sugars. As the mixture incubates, sweetness develops naturally. By another popular recipe, sake kasu is simply mixed with water, but usually sugar is added. Amazake can be used as a dessert, snack, natural sweetening agent, baby food, salad dressing or smoothie. 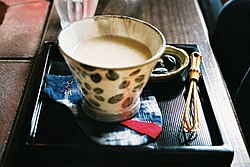 The traditional drink (prepared by combining amazake and water, heated to a simmer, and often topped with a pinch of finely grated ginger) was popular with street vendors, and it is still served at inns, teahouses, and at festivals. Many Shinto shrines provide or sell it in the New Year. In the 20th century, an instant version became available. Amazake is believed to be very nutritious. It contains vitamin B1, B2, B6, folic acid, dietary fiber, oligosaccharide, cysteine, arginine and glutamine. It is often considered a hangover cure in Japan. Outside Japan, it is often sold in Asian grocery stores during the winter months, and, all year round, in natural food stores in the U.S. and Europe, as a beverage and natural sweetener. Similar beverages include the Chinese jiuniang, Korean gamju, and Vietnamese cơm rượu. In grape winemaking, must – sweet, thick, unfermented grape juice – is a similar product. Must – similar product in wine making. ^ Shurtleff, W.; Aoyagi. A. 1988. Amazake and Amazake Frozen Desserts. Lafayette, California: Soyfoods Center. 69 +  pp. ^ "Amazake-Sweet Ambrosia". Mitoku. Retrieved 23 January 2010. ^ "Amazake". About.com. Archived from the original on 16 July 2011. Retrieved 23 January 2010. ^ Belleme, John; Jan Belleme (2007). Japanese Foods That Heal. Tuttle Publishing. pp. 55–58. ISBN 0-8048-3594-2. Retrieved 13 May 2008. ^ "Restaurant Amazake in Hong Kong". www.diningcity.cn. DiningCity. Archived from the original on 31 December 2014. Retrieved 30 December 2014.